The sweet snack isn't just for kids anymore. At least, that's what the brand's in-house agency hopes. The tiny, seedless oranges known as mandarins are very good for you: packed with vitamins and antioxidants, they’re a sweet alternative to more indulgent treats high in processed sugar. They also fit perfectly into a lunchbox and are fun to peel, making them a popular snack for kids. As such, they are rarely marketed to adults. Wonderful Halos is changing that. 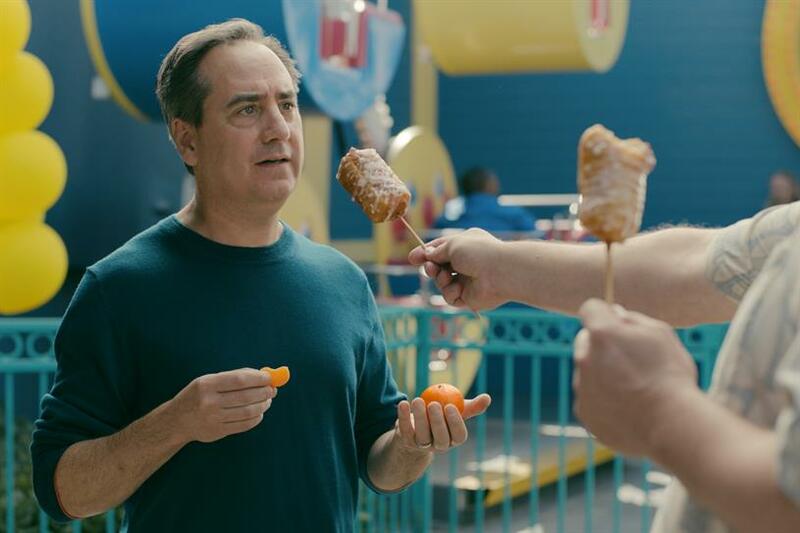 The mandarin ornage distributor, part of the Wonderful Company portfolio of food brands, yesterday launched two spots for their "Good Choice, Kid" campaign, which has previously starred children. This time, the spots are all about adults. "It was logical to take the campaign to other places, so this year we decided to expand our audience to ‘big kids,’ adults who are also tempted to make bad choices in their lives," said Darren Moran, CCO at Wonderful’s in-house agency. "It’s not a shift away from kids; more like an expansion to kids of all ages." The expansion is part of a fully integrated campaign and follows four spots released last fall that placed skeptical kids in far-fetched situations where they had to choose between a contrived scenario – including hanging with creepy twins or breaking into a construction site–and chilling with a Halo. Each 15-second installment ends with the kid choosing the mandarin over ill-advised adventure. "Fifteen seconds can be a challenging length of time for storytelling, but not when you have a simple, funny idea," said Moran. In the new spots, which will air throughout the 2017-2018 winter citrus season, the scenarios are still quirky, but unlike the earlier ones, they’re about food. In "Armageddon," a snacker turns down her neighbors’ offer of deathly-spicy peppers, while "Fair" adds a tinge of gross-out humor to deep-fried fairground fare. "Even though we’re more focused on other food choices with these new spots, it was important to still set them up with over-the-top choices that don’t really exist," Moran explained, "so the spots are still somewhat metaphorical in that sense." Wonderful has invested more than $100 million over the past five years in Halos, and this campaign adds a heavy spend on digital and social, including an upcoming influencer push. "Good Choice, Kid" elements will also appear in print and on a digital billboard in Times Square. Like every campaign for Wonderful brands, all assets were produced by Wonderful Agency, the firm’s in-house creative shop, which also creates the brand’s Super Bowl spots and handles PR and package design. For such a large portfolio, Moran said, in-house is the way to go. "There is no pitching, no politics, no fear of losing the account, which frees us up to focus entirely on the work," he explained. "We’re just as invested as our clients. It’s a pretty unique model and one of the big reasons the Wonderful brands do so well in the marketplace." And they really do: Halos are the fastest-selling brand of mandarins, and other Wonderful brands include the oft-memed FIJI water and popular juice brand POM. Overall, the portfolio’s profits exceed $4 billion annually. And while the company won’t soon be expanding to compete directly with the bad-choice foods included in the campaign, Moran said fairground booths needn’t worry too much. "We may end up putting a few deep fried butter vendors out of work as a result, but maybe they could come work for Wonderful instead."